Organic. 100% durum wheat. Goodness from the ground up. Serves 5. No artificial additives or preservatives. Suitable for vegetarians. 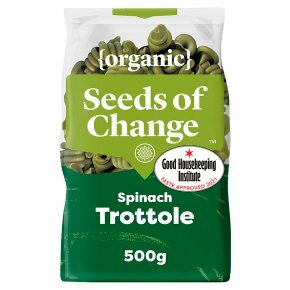 This Spinach Trottole has been made with the world's best pasta wheat (100% Durum). We've also slow-dried it as tradition demands and added organic spinach for an extra savoury character. All that's needed now is a delicious sauce. Decisions, decisions. All the ingredients grown for this product are 100% organic** **Certified Organic. Place pasta in a large saucepan of boiling water (1 litre of water per 100g of pasta).Simmer for 10 mins. to achieve an 'al dente' texture, stirring occasionally.Strain and serve immediately.